Despite dedicated teachers, many Philadelphia public schools are so irrelevant to students’ lives that most enrollees (up to 88 percent) drop out. State curricula and testing serve bureaucracy only. To fix this mess, a green school system that relies on neighbors to teach and the larger community to donate resources is now beginning. Young people will learn most easily from people they respect who teach skills that are fun and useful. They will keep learning if the neighbors around them love learning, too. And they’ll give back to a community that cares about them. Neighborhood Enterprise SchoolTeachers (NESTS) therefore invite adult neighbors (including ex-offenders) to teach life skills to neighborhood kids, stimulating self-respect among young and old. 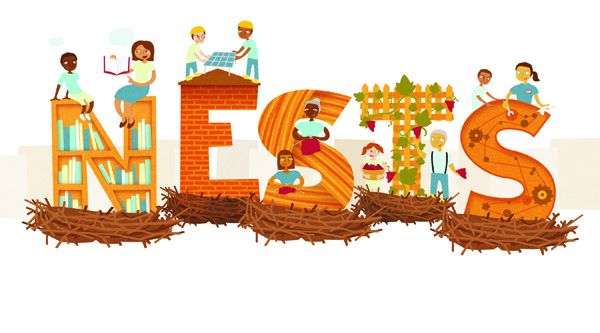 NESTS networkers knock on doors to list the skills of neighbors ready to teach. Weightlifting, cooking, house painting, hairdressing, house repair, health aides, gardening, mechanics, storytelling, knitting, sculpting, dance—all such subjects are welcome. Teachers are paid for teaching—and students for learning—with certificates, which further enhance esteem and employability. Perhaps, they may also receive neighborhood currency that can be spent with local businesses and corporate sponsors, or traded with one another. At the same time, NESTS’ teams visit places of worship, recreation centers, parks or yards to teach how to build, install and maintain simple green technologies that reduce heating and electric bills. They provide free tools and materials. They issue certificates to those who attend the sessions. Neighbors then teach others, and start their own businesses. Dozens of categories of “green collar” jobs such as solar, wind and insulation installation, recycling and repair will prepare people for ecological reindustrialization of this city. Our first NESTS builder is Big Picture Philadelphia (bigpicture.org), which provides “transformational educational experiences for under served youth in the Metropolitan Philadelphia area.” They will be opening two new schools: Eastern University Academy Charter School and El Centro de Estudiantes. Bringing this wealth of skills and community resources together proves that poverty can be overcome by networking, cooperation and respect, with less reliance on dollars.